by Bill Dwight on Thursday, August 19, 2010 at 5:44 PM | LEAVE A COMMENT! Until now, the progress on a savings goal has always been measured relative to an account balance of zero. In other words, if you had a goal to save $50 in your General Spending account, we’d always assume that your starting point was a balance of $0. So, when you reached $10 in your account, you were 20% of the way to reaching your $50 goal. This works great in the typical case where your child is saving up for a future purchase. But what if you’re using an account to track the repayment of a loan? What if you want the saving progress to show how far along your child is in paying off an existing debt? Maybe you purchased a phone or a computer for your child up front or paid off a speeding ticket for your teen (it happens, trust me!) with the expectation that your child will pay off the debt over time using a percentage of allowance and/or money earned from odd jobs. In this case, you start out with a negative account balance (the loan) instead of zero, and you’re tracking progress in shrinking a negative balance instead of growing a positive one. 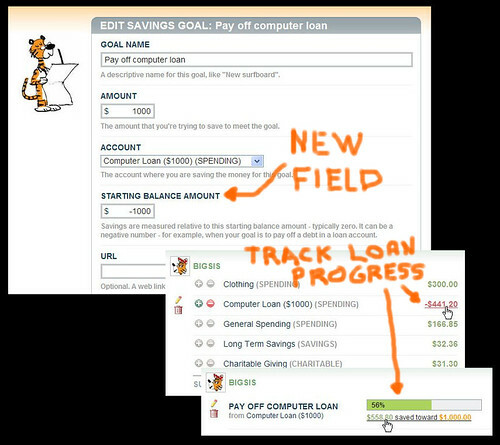 To address this scenario, we’ve added one additional field to the Savings Goal form: the Starting Balance Amount. Just set this to the initial negative account balance of the loan account (i.e., the negative value of the loan amount). Now your savings goal will track your child’s progress in getting that balance back to zero and getting out of debt. By the way, the loan repayment experience can be a great way to teach the real value of a dollar. The extra bonus is that kids take a lot better care of things they’re still paying for! We expanded our timezone coverage to do a better job of accommodating our families in Europe and elsewhere. Now folks outside the US and Canada can get their checklist item reminders on time. 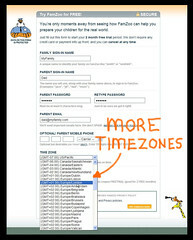 New families will see more timezone options on the registration page. The timezone selected on the registration page serves as the default timezone setting for any additional family members added later. Existing family members can update their timezone setting by visiting the Family tab, clicking on the Settings link, and selecting the desired timezone option on the form. If you don’t see an option for your timezone, just contact us and we’ll see if we can add it for you.